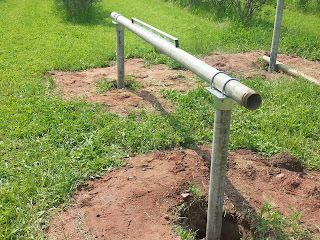 We drilled holes for the uprights (3" diameter, SCH 40, galvanized steel pipe) with the tractor and "planted" the poles in the holes about 40" deep and backfilled with Quikcrete. The poles were purchased to be buried 60" and provide a 45 degree tilt. The tractor auger would go down only about 40" and some follow up calculations figured out that the ideal tilt for May-September usage would be about 31 degrees, so the poles were cut after they were installed. 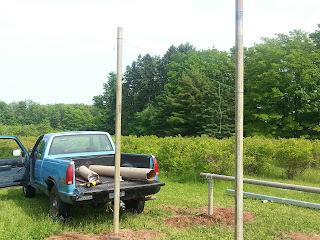 Here is a picture of the cutting of the taller (northern) poles. The rope is being used to pull the left pole, which will be cut, towards the right, so as not to pinch the sawblade. 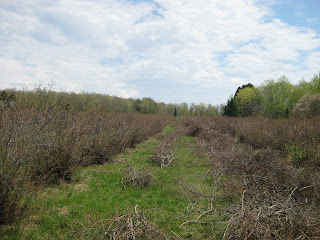 Oh, by the way, two weeks into blossoming of the blueberries, which follow the blossoming of apples. Probably late this year. 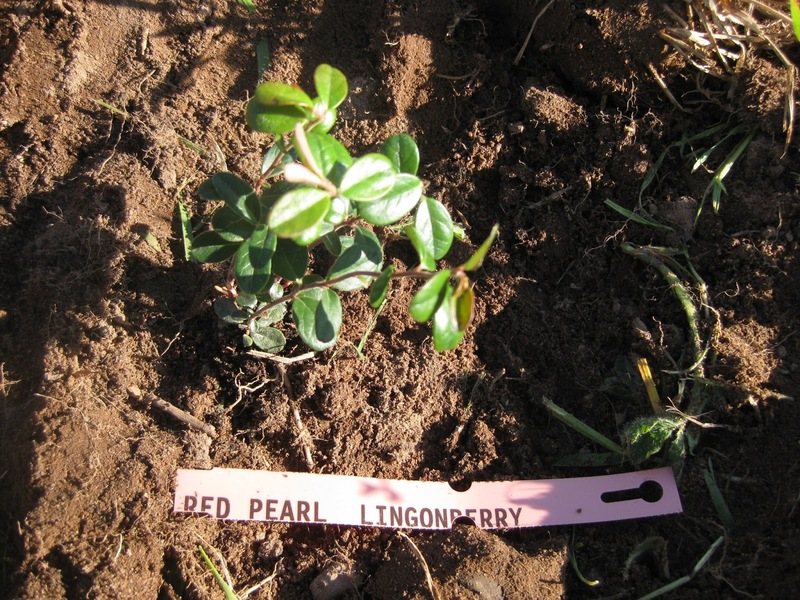 Based on the recommendation of a former Nebraska farmer, Eric Seagren, we ordered and planted 200+ lingonberry plants (1/2 Regal and 1/2 Red Pearl, from Hartmann's Plant Company). 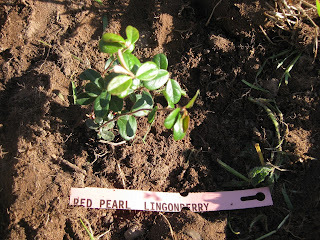 According to the place we bought them, Hartmann's Plant Company: "Lingonberries (Vaccinium vitis-idaea - majus) are related to the blueberry and cranberry. The plants are native in most parts of the United States and Canada. The plants, as they grow, have many branches sprouting from the base and are stoliniferous. Plant height is approx. 12"-18" at maturity and spreading to a width of 18". Leaves are 1/4" long, shiny and dark green. Flowers are plentiful and white in color. Green fruits form, and as they ripen they turn a bright red. This makes a beautiful ornamental as well as an important nutritious fruit crop. The fruits are used in preserves, fruit dishes and pastries. Lingonberries have been an important crop for the Scandinavian countries for many years. Fruits are very good nutritionally and are flavorful. 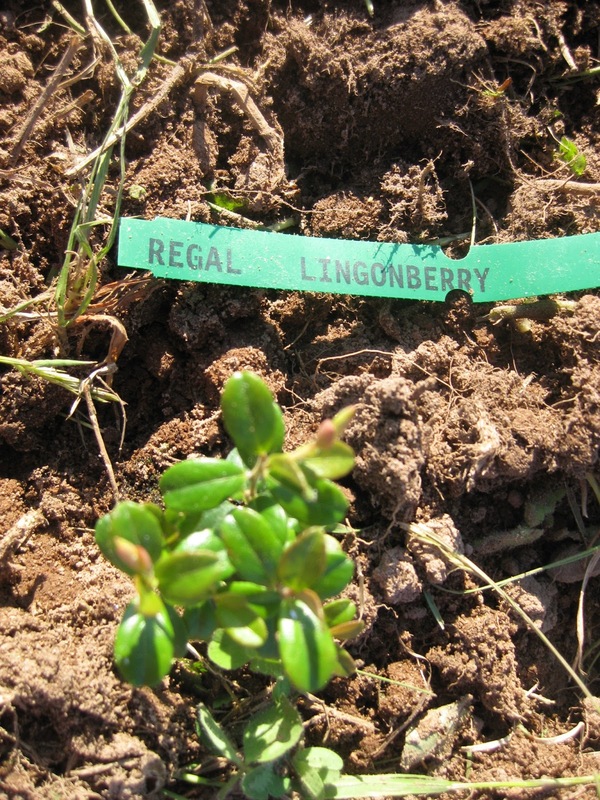 It has good potential as a fruit crop in the United States and Canada, as well as other parts of the world." We planted them in two rows are about 130' long, filling a gap in 2 blueberry rows. Hopefully you can orient yourself. North is "up". Klingville Road would be along the right border. Apple orchard in the SE corner (lower right). 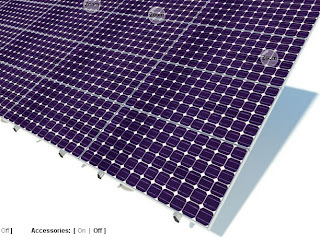 GoogleMap image is from August 2012. My Aunt's fifth -wheel trailer is visible in the upper right. You can even see Stewart, the llama, out standing the field in the middle right. 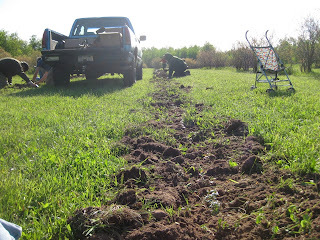 For three hours one evening, we drilled 200+ holes, 12" in diameter, about a foot deep. 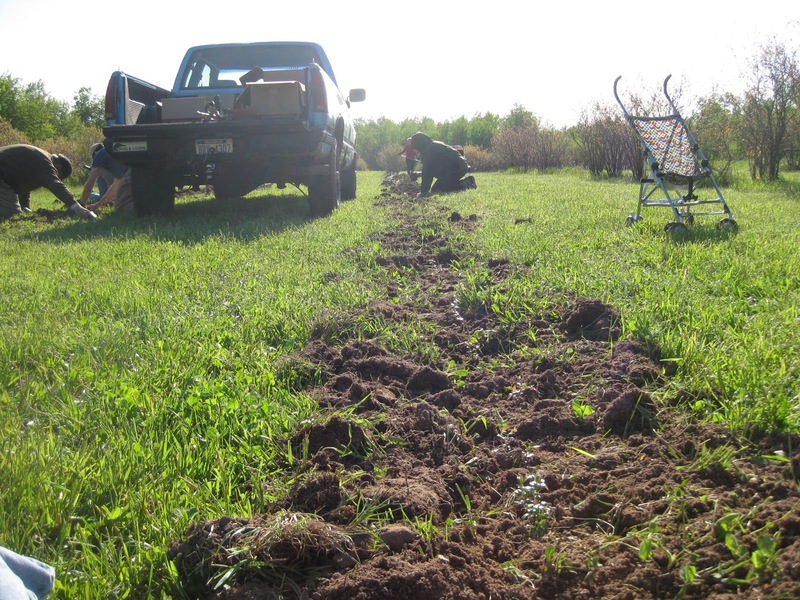 The next evening, Eric Seagren, Ken Hinkel and Wendy Eisner, and their friends visiting from the Netherlands, Ben and Mieke van der Heide, planted the seedlings. 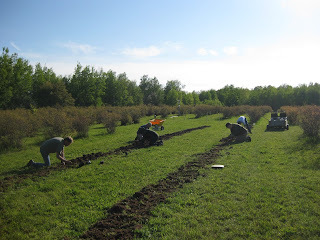 We mixed soil from the holes with peat and then mulched. First berries might come in 3 years. We'll see. 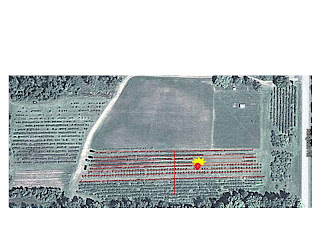 Moisture, temperature, and sunlight are critical conditions for growing crops. 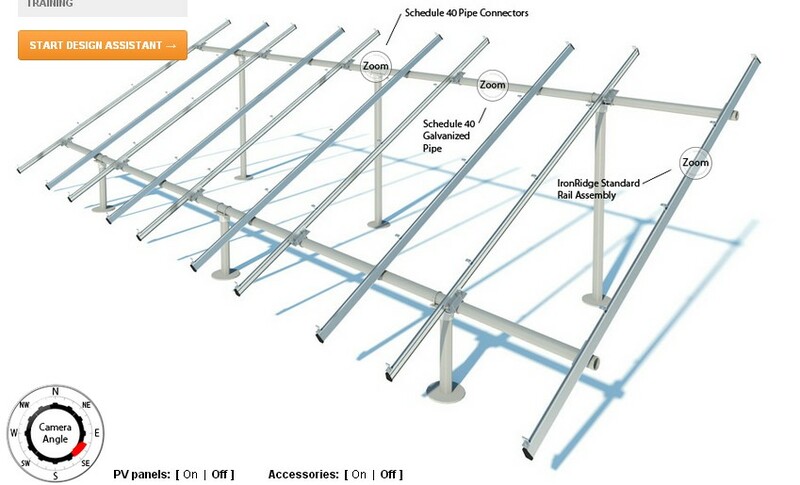 Sophisticated instrumentation for monitoring these conditions has become economically and technologically accessible for even hobby farmers and gardeners. 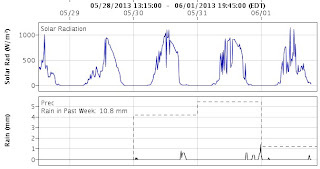 Internet and cellular technologies allow the instrument readings to be uploaded and accessed in near real time. A stroke of luck has resulted in the GBbF now being host to an Onset Weather Station. The station records data hourly and uploads via cellular link to a publically available website (https://www.hobolink.com/p/47316a1a1d140ad082139599206946ab). Sound and look fancy? 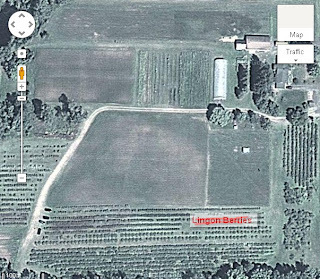 It is, too fancy for this farm, but it worked out as a matter of some convenience, so he says, to University of Cincinnati Geography Professor Ken Hinkel. 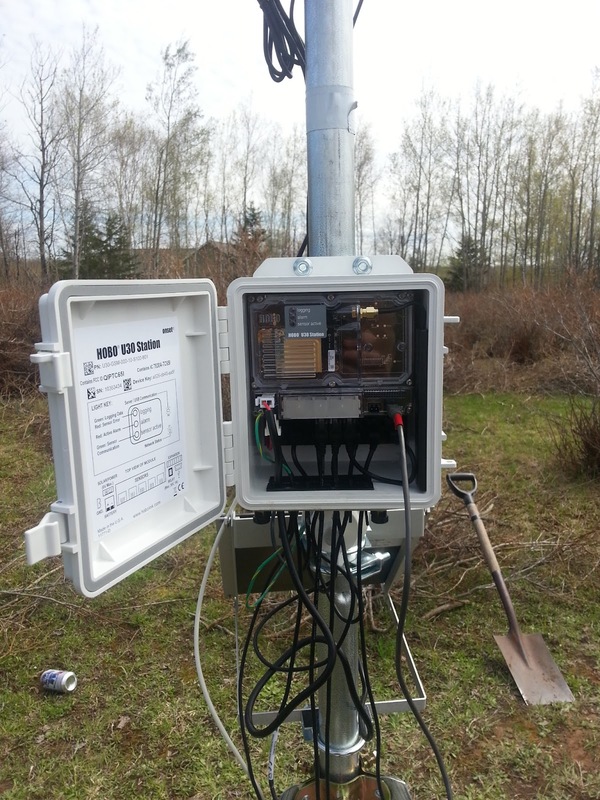 Since 2005, Ken has built and maintained a network of weather stations that collect data on precipitation, temperature, wind, sun, moisture, humidity, and atmospheric pressure, in the Western Upper Peninsula along the shore of Lake Superior. His research interests are in the complex influences of large water bodies on local, near-shore climates, something called the “maritime effect.” Ken has a summer cottage on Keweenaw Bay and has been collecting shoreline climate data there for years and has been looking for an upland location nearby for a paired weather station. As luck would have it, we are located the perfect distance upland from his cottage. We had to do some negotiations, because this instrument is research grade, for that is its basic purpose. So Ken had to agree to set it all up. 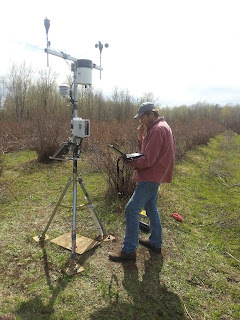 He also had to volunteer pruning a set amount of hours, which he did, but sometimes had to do it in the cold rain to get the hours in in time for the weather station installation. He drives a hard bargain. 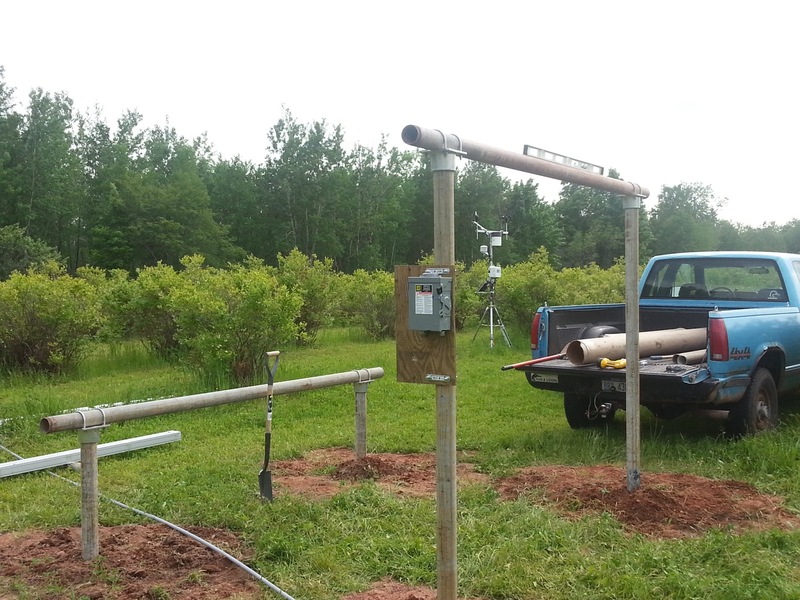 The weather station records data, it does not predict the weather, so the data is interesting to pickers but it will not be useful in deciding when to come pick blueberries if weather is a concern. Think of it as an educational tool. 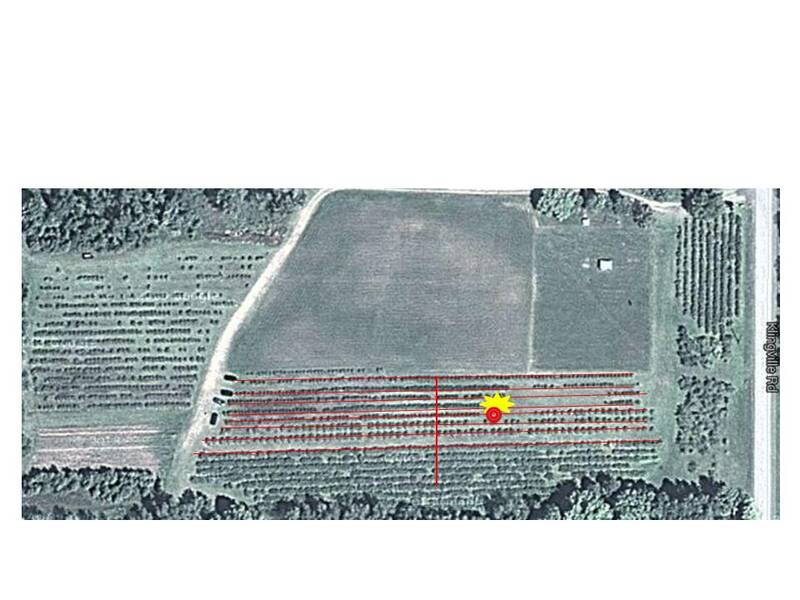 Maybe some locals will find the soil temperature and precipitation useful for agricultural purposes. 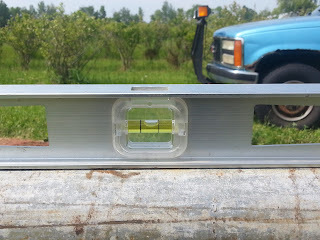 I am going to get a lot of use out of it for the irrigation system I am installing. More on that in the future. The station measures soil moisture 3 inches beneath the surface using an instrument that monitors changes in a property called the dielectric constant, which varies with the amount of water present. 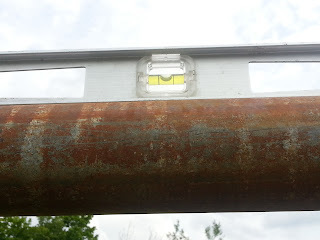 The measurement is converted to an estimate of the water content (volume of water per bulk volume of soil) using “average” soil conditions. 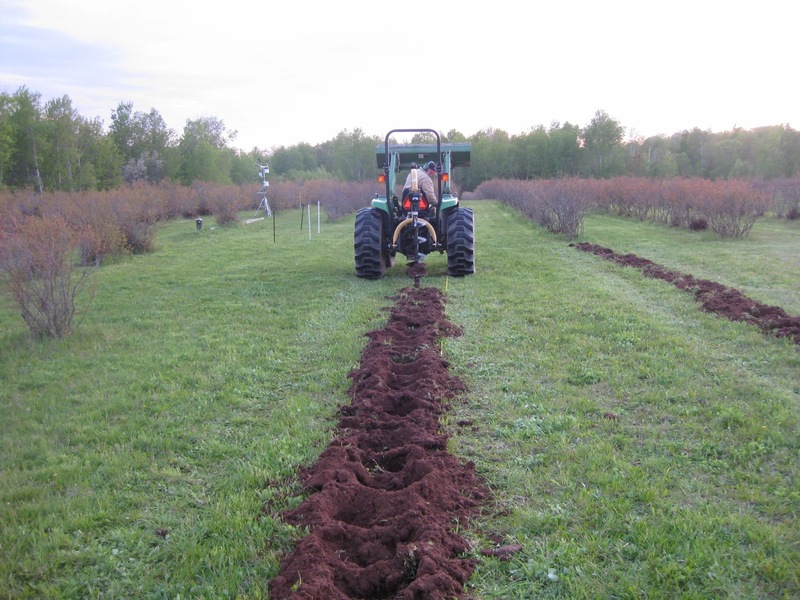 We all know there is no such thing as an average soil, so the water content measurement is only an approximation and really one should examine the trends rather than fret about the actual value. All of the other conditions are direct measurements. 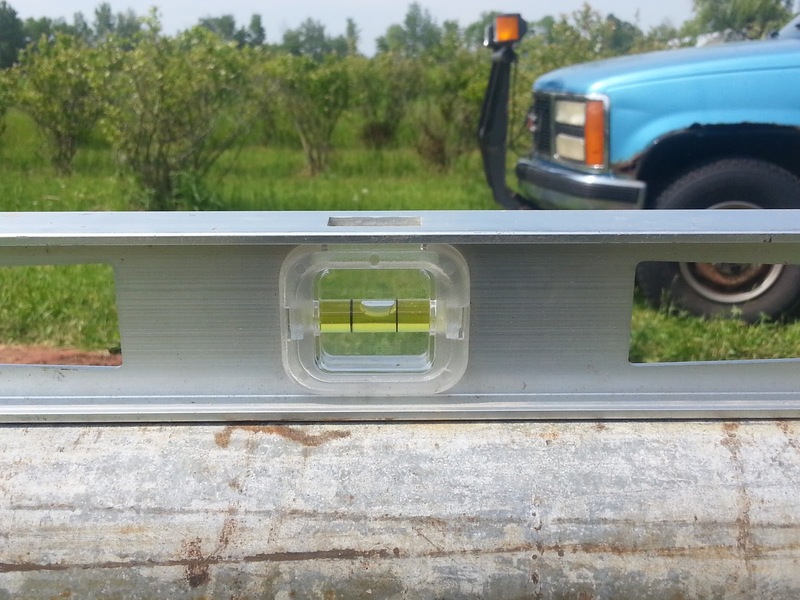 Soil temperature is also measured at the 3-inch depth. You will notice that the reported units for each variable are in metric (remember, this instrument is for research). I suspect that precipitation will be of interest to many. 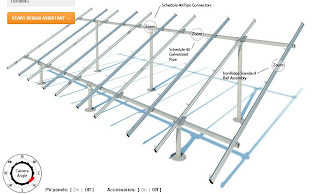 I am going to use the solar radiation measurements in analyzing my solar-powered pump for the irrigation (to be installed in the next few weeks). Stations like these are deployed across the country. 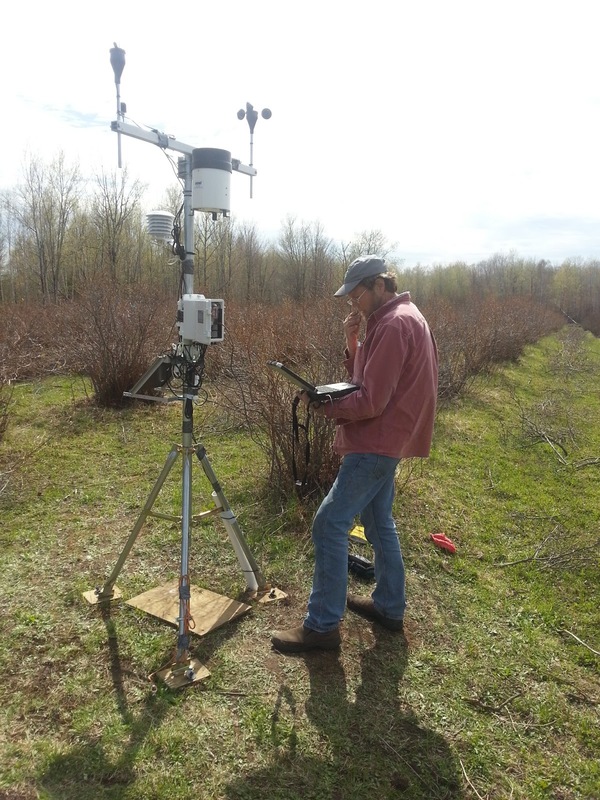 Michigan State University Extension hosts the Enviro-weather website (enviroweather.msu.edu), which provides links to climate data from across the state and weather-based tools for farmers. More information about Ken’s work in the WUP was recently published in an article co-authored with Fred Nelson and titled, “Spatial and temporal aspects of the lake effect on the southern shore of Lake Superior,” in the journal Theoretical and Applied Climatology (vol. 109, issue no. 3-4, pages 415-428). Unfortunately, Ken and Wendy head up to the North Slope at the start of August for their climate research there (http://northslope.arcticmapping.org/history/history.html), prior to returning to their professor duties at the University of Cincinnati. So you will not have a chance to meet them and discuss climate studies during the berry season. If you are in the neighborhood of the farm in the evening this month or next, you might catch the visiting us around the fire ring, so make sure you stop.